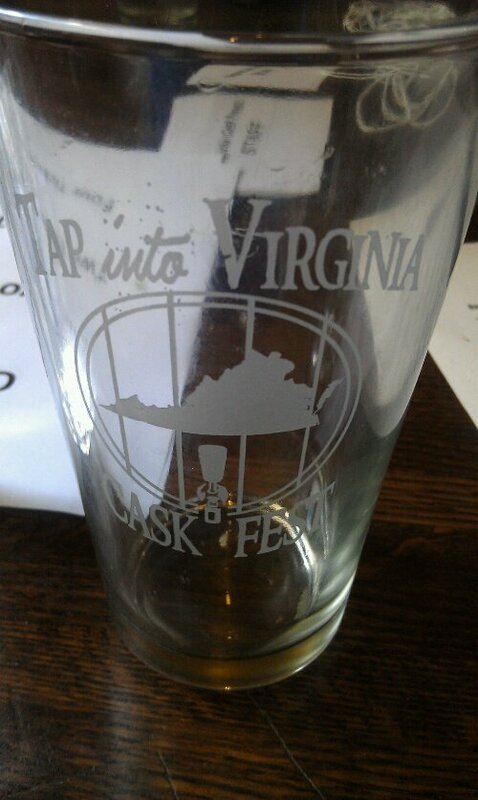 I attended the first Virginia Cask Festival this past Saturday, April 21st. Arriving a bit late, the crowd was noticeably thin but buzzing excitement. Everyone in the room was there for beer. I started out light with Devils Backbone’s Wit Bier then dived head first into Hardywood’s Bourbon Cru. By all accounts, Hardywood’s Cru was a crowd favorite. In addition to the Cru, Mad Fox’s Wee Heavy and Williamsburg Alewerk’s Choca-Latte were a malt lovers dream in a room of IPAs. I had the pleasure of meeting Bill Madden of Mad Fox for the first time and thanked him for bringing one of my personal favorites from the Falls Church brewery. I will say the only beer I was disappointed with was O’Connor’s Great Dismal Black IPA. Normally, a favorite of mine, something about the addition of coffee did not work for me. On the other hand, I found Starr Hill’s Double Platinum quite enjoyable and balanced as it is normally too hoppy for me. Turning thoughts to next year’s festival, there are a couple items that I think would make next year’s festival even better. With only eleven breweries in attendance, it may have been difficult for people to justify the price of admission. The festival was a fundraiser for the Virginia Craft Brewers Guild; breweries who were not guild members were rightfully not allowed to participate. So in order to grow the festival, more Virginia breweries need to join the guild. VCBG has done a great job promoting craft beer in Virginia, most notably the passing of SB 604 which will allow breweries(member or not) to sell pints without having to server food. If we are able to increase the number of breweries at the festival, it would most likely necessitate a larger venue. Capital Ale House’s Music Hall was the perfect size for this years festival but add another five or ten breweries in the mix and the room could feel cramped. I think Kanawha Plaza would be a nice step up from the Music Hall plus Richmond loves an outdoor festival. How can you help? Next time you visit a Virginia brewery ask if they are VCBG members. If they say no, ask them why not. If they say yes, thank them for making great beer here at home. Hardywood Park Craft Brewery — Bourbon Barrel Quad Yes you could wait to get it next weekend but why wait?! Mad Fox Brewing — Wee Heavy Scotch AleNot available in Richmond; you’d have to drive up to NoVA to have anymore of their great beers. Devils Backbone Brewing — 1)Wit Bier – 4.5% ABV, 15 IBU Belgian-style witbier that is hazy straw in color, light in body, with a refreshing fruity spicy finish. Spiced with coriander, orange peel, szechuan peppercorn, and brewed with an aromatic Belgian yeast strain to create a complex yet delicate wheat ale. 2) White Stag IPA – 7.0% ABV, 50 IBU’s. A wheat IPA that blends aspects of American IPA’s, British IPA’s, and wheat ales . Brewed with 4 types of malted & un-malted wheat, kettle hopped with both American and English hops, and dry hopped with East Kent Goldings to create a beer that’s uniquely its own. Choose between two Devils Backbone beers? Not going to happen. O’Connor Brewing — Great Dismal Black IPA – infused with “Old Havana Cuban Coffee Blend” from Virginia Espresso in Norfolk, chocolate and vanilla bean. ABV- 8%. A personal favorite so of course it’s here. Wild Wolf Brewing — Tom Tom Founders Festival Ale — White IPA with extreme citrus and tropical hop notes added to the flavor of a traditional belgian wit, dry hopped with a pound of cascade. The brew used more than 60 pounds of local VA wildflower honey. 70IBU 5.5% ABV White IPAs are a very new style so I’m looking forward to trying this one from another Nelson county brewery. 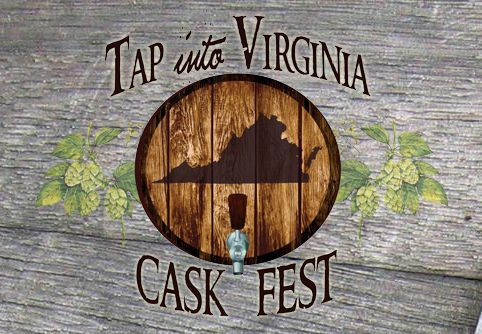 Tomorrow, Friday April 20th, is the last day you can buy advance tickets to the inaugural Tap into Virginia Cask Festival. The festival will be held at the Downtown Capital Ale House Music Hall for two sessions on Saturday, April 21st. Devils Backbone Brewing — 1) Wit Bier – 4.5% ABV, 15 IBU Belgian-style witbier that is hazy straw in color, light in body, with a refreshing fruity spicy finish. Spiced with coriander, orange peel, szechuan peppercorn, and brewed with an aromatic Belgian yeast strain to create a complex yet delicate wheat ale. 2) White Stag IPA – 7.0% ABV, 50 IBU’s. A wheat IPA that blends aspects of American IPA’s, British IPA’s, and wheat ales . Brewed with 4 types of malted & un-malted wheat, kettle hopped with both American and English hops, and dry hopped with East Kent Goldings to create a beer that’s uniquely its own. O’Connor Brewing — Great Dismal Black IPA – infused with “Old Havana Cuban Coffee Blend” from Virginia Espresso in Norfolk, chocolate and vanilla bean. ABV- 8%. St. George Brewing — Imperial Pale Ale – 10% ABV English style pale ale with 100% UK Fuggles and dry hopped with UK Fuggles. Remember, real ale is truly beer in its most natural delicious state. All proceeds from the festival go to support the work of the Virginia Craft Brewers Guild. What are you waiting for? Get your tickets to the afternoon (noon – 4pm) or evening (6 – 10pm) session. Head over to the festival website or Facebook event for further updates. Richmond, Get Ready for Real Ale! How fresh do you like your beer? If the answer is REAL fresh, then get ready for real ale Richmond! The Tap into Virginia Cask Festival will be the first cask festival to happen in Richmond and most likely Virginia as well. The festival will be held at the downtown Capital Ale House Music Hall for two sessions on Saturday, April 21st. O’Connor — Great Dismal Black IPA — Infused with “Old Havana Cuban Coffee Blend” from Virginia Espresso in Norfolk, as well as chocolate and vanilla bean. Devils Backbone — White Stag IPA. A wheat IPA that blends aspects of American IPA’s, British IPA’s, and wheat ales. Brewed with 4 types of malted & un-malted wheat, kettle hopped with both American and English hops, and dry hopped with East Kent Goldings to create a beer that’s uniquely its own. Remember, real ale is truly beer in its most natural delicious state. All proceeds from the festival go to support the work of the Virginia Craft Brewers Guild. So go ahead and get your tickets to the afternoon (noon – 4pm) or evening (6 – 10pm) session. Head over to the festival website or Facebook event for further updates.